Resonating with security elites, obtaining goals and spurring debate—if only all nuclear disarmament initiatives were effective on these levels...but they aren't. 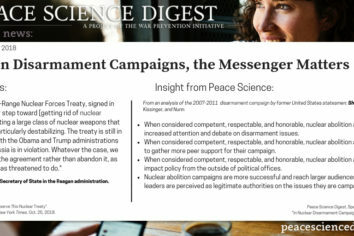 Peace Science provides insight-through disarmament campaigns from former U.S. Statesmen like Shultz, into how the perceived legitimacy, power, and language of certain people can influence our thinking and impact policy concerning nuclear disarmament efforts. Peace agreements are not helped by boasting about policy successes that have not yet happened and weakening relationships with strategic allies. Peace science points to more effective roles mediators and negotiators can play to achieve durable peace. Suspending War Games Is Good! 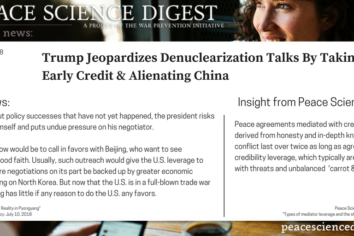 Concessions Lead To More Talks…Even Denuclearization. 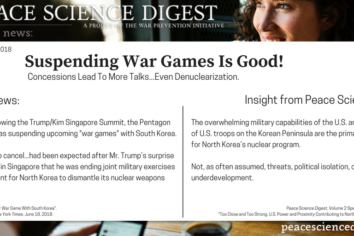 Following the Trump/Kim Singapore Summit, the U.S. canceled their upcoming "war games" with South Korea. The New York Times and peace science agree that early concessions can lead to big payoffs when denuclearization is on the negotiating table. 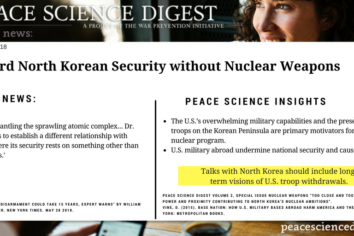 Talks with North Korea should include long-term visions of U.S. troop withdrawals.